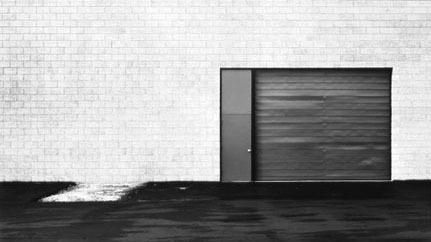 Lewis Baltz documents the changing American landscape of the 1970s in his series, "New Industrial Parks Near Irvine, California." The project’s 51 pictures depict structural details, walls at mid-distance, offices, and parking lots of industrial parks. 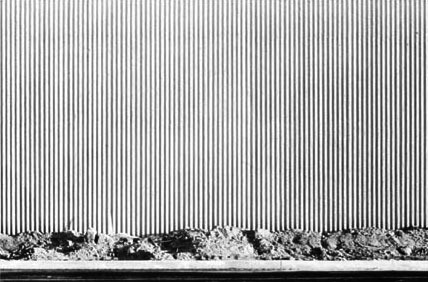 Contrast and geometry are important in these pictures, but what marks them as uniform is Baltz’s attention to surface texture and lifeless subject matter. 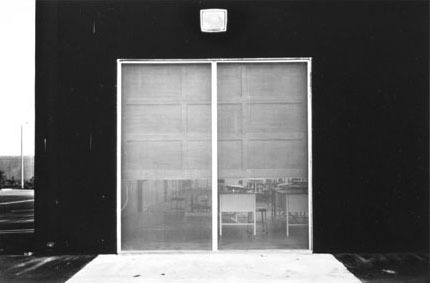 Often displayed in a grid format, it is important to Baltz that his pictures be seen collectively as a group or series. 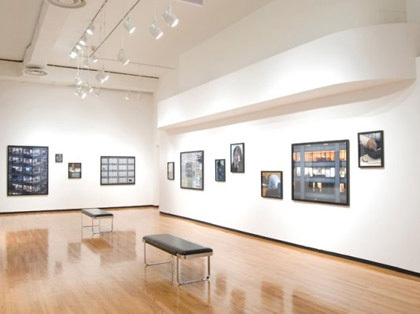 The series format suits his desire that no one image be taken as more true or significant than another, encouraging the viewer to consider not just the pictures but everything outside of the frame as well, emphasizing the monotony of the man-made environment. The pictures themselves resist any single point of focus, framed as they are to present the scene as a whole without bringing attention to any particular element within. Shot with a 35mm lens on a 35mm camera (usually at eye level), and stopped down for maximum depth of field, Baltz chooses his materials for maximum clarity and precision. He takes care to title his pieces with specific information on each site’s location, so that viewers could return to the same exact place. 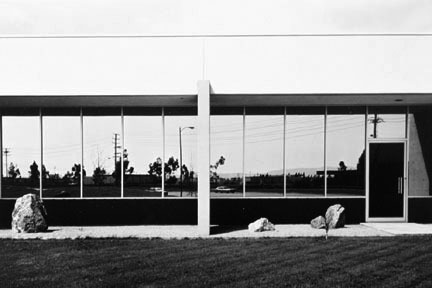 Lewis Baltz was born in Newport Beach, California in1945. He currently lives in Saulsalito, California and Milan, Italy. He holds a BFA from San Francisco Art institute (1969) and an MFA from Claremont Graduate School (1971). Baltz was awarded a National Endowment for the Arts grant in 1973 and a John Simon Guggenheim Memorial Fellowship in 1977. He has exhibited at the Centre Georges Pompidou, Paris; Stedelijk Museum, Amsterdam; and the Los Angeles County Museum of Art. His work is in the collections of numerous institutions, including the Metropolitan Museum of Art, New York; Whitney Museum of American Art, New York; Metropolitan Museum of Photography, Tokyo; Corcoran Gallery of Art, Washington D.C.; and the Art Institute of Chicago.